The Living Arts Centre, located in Mississauga’s City Centre, is a cultural landmark and resource for arts, education and business in the Greater Toronto Area. The Centre houses 225,000 square feet of performance venues, studio spaces and exhibition display areas. Since it opened its doors in 1997, more than five million people have visited the Living Arts Centre to enjoy performances, showcases, conferences and a variety of other events. The Living Arts Centre’s companion website also serves as an important resource as it provides facility booking information, event details, ticket purchasing and much more. 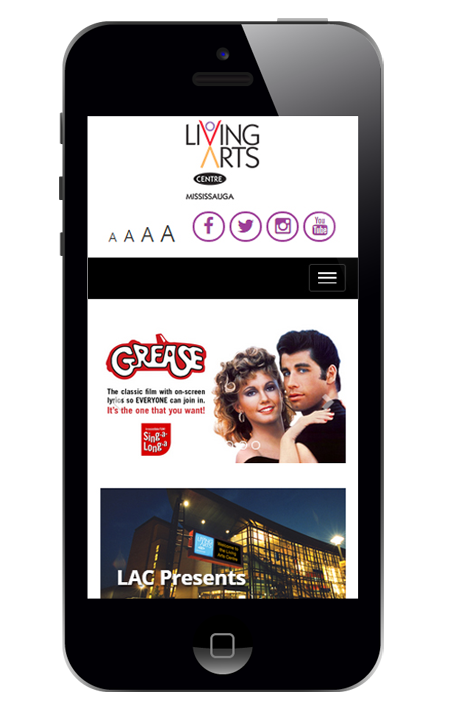 In mid-2014, the Living Arts Centre’s marketing team began rebuilding its website on the Agility CMS Platform. The site launched in early 2015. 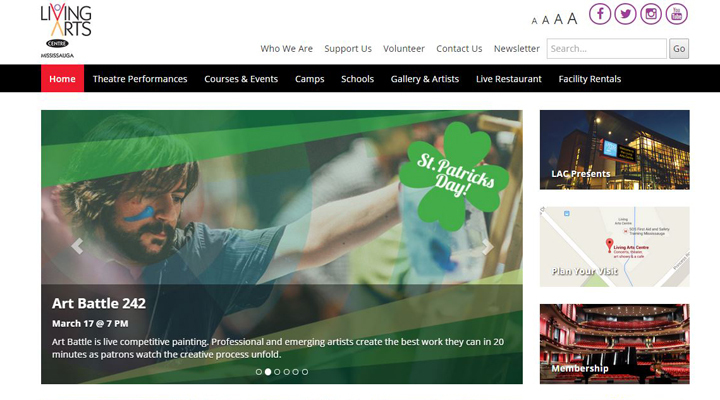 The Living Arts Centre’s previous website was built and managed on a complicated content management platform that required manual HTML and CSS to update and publish content on the website. When the brand set out to rebuild its website, the online team wanted to implement a user-friendly content management platform in order for its users to rely less on manual configuration and technical know-how to create content and update the website. Another top priority of the LivingArtsCentre.ca overhaul was to design and build a website that could be optimally consumed across different devices – desktops, smartphones and tablets. The new website also had to comply with the Accessibility for Ontarians with Disabilities Act, legislation that mandates a set of guidelines to ensure websites are accessible and user-friendly for those with disabilities. The legislation kicked in January 1, 2014. After this date, a public website that is launched or significantly refreshed (and any content published after January 1, 2012), must follow the World Wide Web Content Accessibility Guidelines. The Agility CMS Platform includes content management features that make publishing content and updating websites easy for even the most non-tech savvy users. The marketing team no longer has to rely on manual HTML and CSS coding. The Agility CMS-powered website boasts a clean and modern design that it easy to navigate. It was built using a responsive design framework, and the website’s layout adapts to its viewing environment in order to be optimally consumed across different devices. To comply with the Accessibility for Ontarians with Disabilities Act, content on the website is now more accessible as it provides users with the option to view the site in large font sizes. Additionally, the website’s content can be consumed using assisted technologies, like screen readers, without losing any meaning. The implementation of Agility CMS has been a big success for the Living Arts Centres’ marketing team. “Agility CMS is a huge improvement from our previous content management platform. Creating and publishing content is now simple and streamlined. It was also great working with the Agility CMS Team. They were helpful, quick to respond and very knowledgeable about their product,” Gary Li, Digital Marketing Specialist for the Living Arts Centre, said.